McLendon McBlog: Get Well Soon, Memaw! Here are some pics for my Memaw, who is not feeling well because we infected her and her house with germs on our visit. I'm sorry, Memaw. Anyhoo, I spent gobs of time at my Memaw's house growing up, so its truly one of my favorite places to be. Claudia now enjoys her time at Memaw's house... reading, running, jumping on beds, eating ice cream sandwiches, playing piano and dress up. And what a treat, Aunt Josie came to visit too. 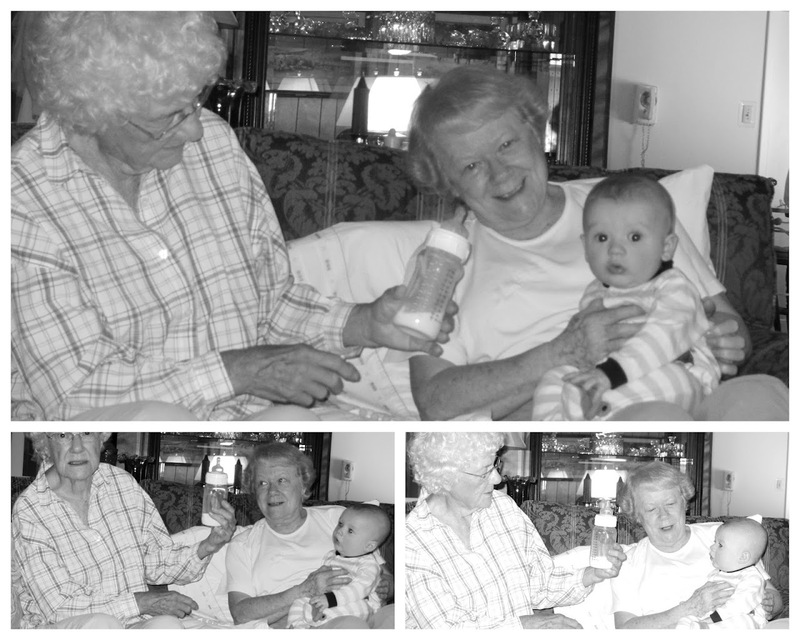 Aunt Josie and Memaw are sisters, and although they couldn't be any different, they have always been best friends. 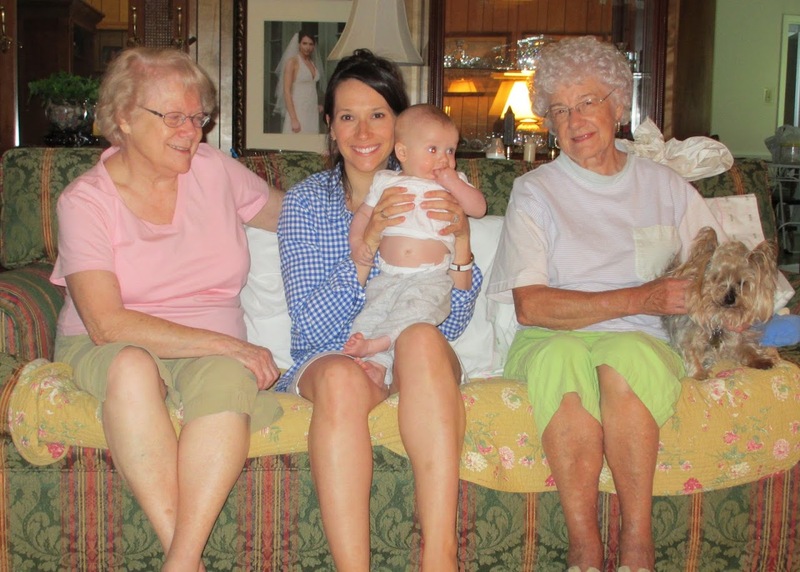 Paddy enjoyed squirming around on Memaw's quilts and being cuddled by Memaw. I'm already wishing I was back at Memaw's house right now! Memaw and Josie enjoyed cuddling and chatting with Patrick. Really, who wouldn't? He's so huggable. And this picture, I just want to poke that squishy belly of his. 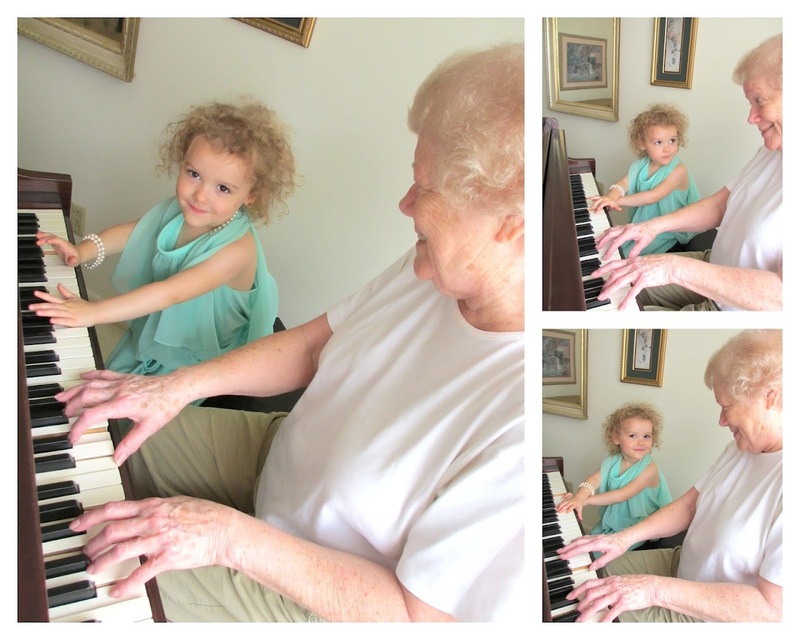 Here is Claudia playing piano with Memaw. She's dressed up in one of Memaw's old choral ensemble gowns and pearls. Patrick got lots of love and attention from Memaw. And I got lots of sweet pictures. Paddy loves his Great Memaw. And lastly, some funny pics of Memaw and Josie. I think they were discussing how much Patrick needed to eat. I wish I could recall the exact conversation. But sadly, I just heard a crash upstairs, which means Claudia is awake. Gotta run before she heads to Paddy's crib to "check on him." What special pics those are - will be treasured for sure! These are some special pictures!